Tibetan Buddhism is the body of religious Buddhist doctrine and institutions characteristic of Tibet and the Himalayan region. It is a multifaceted and integrated teaching, naturally implementing methods for all human-condition levels: Hinayana, Mahayana, Vajrayana (Tantric Path) and Ati Yoga (Dzogchen). In the past Tibetan Buddhism was referred to by some as «Lamaism» out of a misunderstanding of the role of a Lama (Tib.) (or Guru (Skt. ), both meaning Teacher) in Tibetan Buddhism. In common with other Tantric schools (primarily Shingon Buddhism in Japan), Tibetan Buddhism is esoteric and tantric. It is esoteric because it requires an empowerment (dbang) for practice. It is tantric because it emphasizes the tantric methods of transformation as the path.It is mainly in Tibetan Buddhism that Buddhist Tantra has been transmittedto our time. In common with Mahayana schools, Tibetan Buddhism believes in a Pantheon of Buddhas, bodhisattvas, and Dharmapala, also known as Dharma protectors. Bodhisattvas are enlightened beings who themselves are able to escape the cycle of death and rebirth but compassionately choose to remain here in this world to assist others in reaching nirvana or Buddhahood. Dharma protectors are mythic and often fearsome figures incorporated into Tibetan Buddhism from various sources including Hinduism and the Bön religion. They are pledged to protecting and upholding the Dharma. A town or district may have its own Dharma protector with its own local mythology. This pantheon is variously interpreted as representations of functions of the psyche, reminiscent of Jungian dream theory, or taken literally by, for instance, Tibetan peasants. Tantric practitioners make use of special rituals and objects. Meditation is an important function which may be aided by the use of certain hand gestures (mudras) and chanted mantras (such as the famous mantra of Chenrezig: «om mani padme hum»). A number of meditation techniques are employed by different traditions, including mahamudra, dzogchen, and in the Kagyu school the Six yogas of Naropa. Qualified practitioners may also study or construct special cosmic diagrams known as mandalas which assist in inner spiritual development. A lama may make use of a dorje, a small eight-pronged dumbbell-like object representing a diamond-strong sceptre which represents method or compassion, along with a handbell known as a drilbu which represents wisdom. A ritual dagger or phurpa is symbolically used to kill demons, thus releasing them to a better rebirth. Villagers may also gain blessings by observing or participating in cham dances. Energetic dancers wearing masks and richly ornamented costumes perform each sacred dance while accompanied by monks playing traditional Tibetan musical instruments. The dances offer moral instruction such as non-harm to sentient beings and are said to bring merit to all who observe them. In Bhutan the dances are performed during an annual religious festival known as Tsechu, which is held in each district. At certain festivals a large painting known as a thongdrol is also briefly unfurled — the mere glimpsing of the thongdrol is believed to carry such merit as to free the observer from all present sin (see Culture of Bhutan). Cham dances are prohibited in Tibet by the PRC government. Kagyu(pa), Oral Lineage, headed by the Karmapa and having four major sub-sects: the Karma Kagyu, the Tsalpa Kagyu, the Baram Kagyu, and Pagtru Kagyu; as well as eight minor sub-sects, the most notable of which are the Drikung Kagyu and the Drukpa Kagyu; and the once-obscure Shangpa Kagyu, which was famously represented by the 20th century teacher Kalu Rinpoche. There is also an ecumenical movement known as Rime (alternative spelling:Rimed). The Bön religion, which predated Buddhism in Tibet, is often counted as a school of Tibetan Buddhism because it has assimilated Buddhist doctrine almost entirely over the last thousand years. Bön practitioners claim that their mythical founder, Tönpa Shenrab, simply taught a doctrine nearly identical to that of Shakyamuni Buddha, and that earlier animist practices by Bönpos were an aberration. Primary source for the former is the Abhidharmakosa by Vasubandhu and commentaries. The Abhidharmakosa is also an important source for the Sautrantikas, Dignaga and Dharmakirti are their most prominent exponents. Yogacarin base their views on texts from Maitreya, Asanga and Vasubandhu, Madhyamikas on Nagarjuna and Aryadeva. There is a further classification of Madhyamaka into Svatantrika-Madhyamaka and Prasangika-Madhyamaka. The former stems from Bhavaviveka, Santaraksita and Kamalashila and the latter from Buddhapalita and Chandrakirti. It is not clear, if these four schools ever actually existed as distinct traditions in India or if this classification was introduced by Tibetan Scholars only after the transmission to Tibet. The tenet system is used in the monasteries and colleges to teach buddhist philosphy in a systematic way. Therein the four schools can be seen as a gradual path from a rather easy to grasp, «realistic» philosophical point of view to more and more complex and more subtle views on the ultimate nature of reality, that is on emptiness and dependent arising, culminating in the philosophy of the Madhyamikas, which is widely believed to present the most sophisticated point of view. Although there were many yogis in Tibet, monasticism was the foundation of Buddhism. It’s estimated that as much as 25% of the population of Tibet was monastic from the 16th century through the Chinese invasion. There were thousands of monasteries in Tibet, and nearly all were ransacked and destoyed by the Chinese communists. Most of the major ones have been at least partially reestablished. The three most important centers of the Gelugpa lineage are Sera, Drepung and Ganden Monasteries. Many Kagyu monasteries are in Kham, eastern Tibet. Tsurphu, one of the most important, is in central Tibet, as is Ralung. Certain Buddhist scriptures arrived in southern Tibet from India as early as 173 CE during the reign of Thothori Nyantsen, the 28th king of Tibet. During the third century the scriptures were disseminated to northern Tibet (which was not part of the same kingdom at the time). The influence of Buddhism was not great, however, and the form was certainly not tantric, as the earliest tantric scripture texts (tantras) had only just then begun to be codified in India. Tibetan Buddhism exerted a strong influence from the 11th century CE among the peoples of Central Asia, especially in Mongolia and Manchuria. It was adopted as an official state religion by the Mongol Yuan dynasty and the Manchu Qing dynasty of China. Today, Tibetan Buddhism is adhered to widely in the Tibetan Plateau, Bhutan, Mongolia, Kalmykia (the Russian north Caucasus), Siberia (central Russia), and the Russian Far East. In the wake of the Tibetan diaspora, Tibetan Buddhism has gained adherents in the West and throughout the world; there are estimated to be thousands of practicioners in Europe and the Americas. 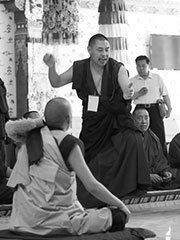 Western celebrity Tibetan Buddhism practioners include Richard Gere, Adam Yauch, Allen Ginsburg; Philip Glass, and Steven Seagal, who has been proclaimed a tulku . Seagal’s tulku status and martial arts skill positioned him to be chosen as godfather to Yabshi Pan Rinzinwangmo. Rinzinwangmo, or «Renji,» is the only child of the 10th Panchen Lama of Tibet. Renji studied in the United States for a brief period, and her family relied on Seagal for her safekeeping.